When you travel, look for something unique to that area to see or do. And fork out the money to do it. Otherwise, what is really the point? Traveling somewhere just to relax is great, but you can accomplish much of that in a stay at home vacation. Yes, get some R & R but don’t just stick around the resort. Venture out and about and find something outside the common tourist activities. It may be a little risky or out of your comfort zone. It may involve a taxi ride with someone who doesn’t speak your language. It may mean braving the elements – hot, windy, wet, or frigid. But you’ll treasure the experience and the memory. And take lots of pictures. Write down notes of your experience. Otherwise, the recollection will fade. 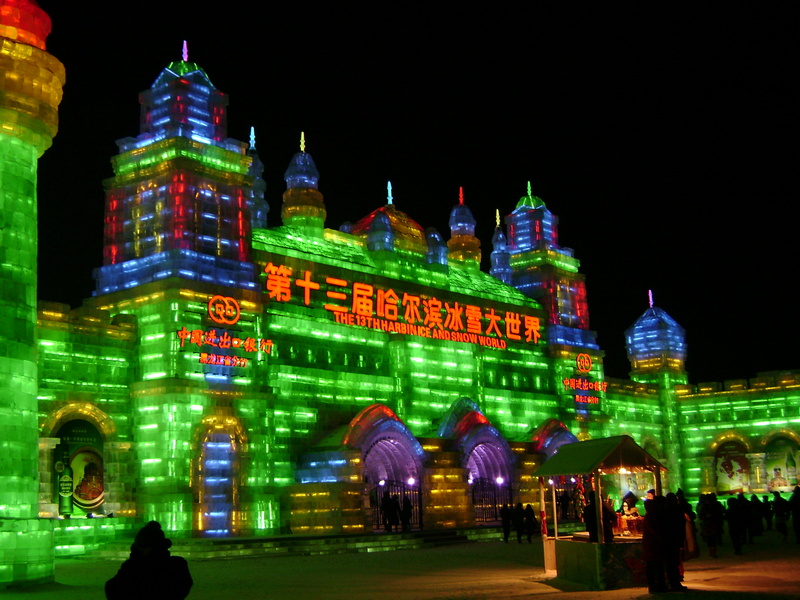 Case in point: The Ice and Snow World in Harbin, China. I just happened to be there recently on a short business trip with some coworkers. In fact, we were so busy each day with commuting and working that there was hardly any time left to eat dinner each night. But we had heard about the Ice and Snow World, opening just the week prior. So a group of us went one night. But it wasn’t as easy as merely buying tickets and walking in the gate. It was -18 C outside and windy that night. It was too far to walk from the hotel. There had been a language barrier between us and the cab driver, who spoke no English. Nor did the woman who got in the taxi with us at our hotel, supposedly to buy us tickets to the ice show. We trustingly each gave her 300 RMB (about 48 bucks) for tickets and watched her ditch us not once, but twice before she actually got us inside the grounds of the ice show and then we never saw her again. We were relieved to find our taxi still waiting for us an hour and a half later when we’d had enough of the frigid cold. While we walked about the enormous grounds, we were awestruck by the sheer size, number, and variety of the ice sculptures, snow sculptures and full-scale buildings, modeled using the architecture from numerous regions, made entirely of ice blocks that were fused together like brick and mortar. Making it even more magnificent was the colored lighting within the ice of every part of every building. And this night there was a near full moon in the black sky to frame the scene. This was a world class event – something you might see once in a lifetime. Glad I was lucky enough to be there when it was going on. And yes, I took lots of pictures although my fingers got so cold I could hardly feel the camera. 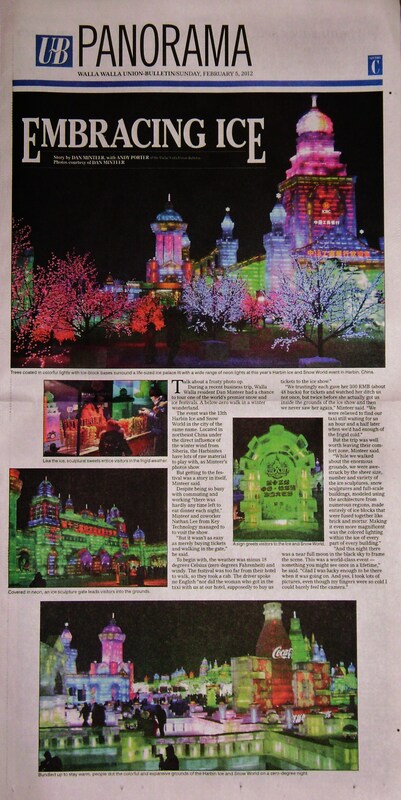 Our local newspaper the Union Bulletin enjoyed these picture so much that they ran an article about this cool event.